An eventful week as the US market had its biggest upsurge since early July 2010. Economic reports ended the week with a positive bias too: positives outpacing negatives 9 to 6. On the negative side: the monetary base, WLEI, construction spending, consumer sentiment, and consumer confidence all declined. The weekly jobless claims ticked higher too. On the positive side: excess reserves, PCE prices, Case-Shiller, pending home sales, the Chicago PMI, ISM manufacturing, and auto sales all moved higher. Personal income/spending remained positive. The equity markets gained every day of the week as the SPX/DOW surged 5.50%, and the NDX/NAZ was +6.35%. Asian markets gained 1.6%, Europe rallied 5.2%, the Commodity equity group was +3.8%, and the DJ World index rose 5.1%. Next week will be highlighted by friday’s Payroll report, ISM services and Factory orders. The bull market resumed this week after a multi-week 8.2% correction. Our primary count remained in place, despite several medium term alternative counts gaining in probability as the correction unfolded. We have been counting this bull market as a five Primary wave Cycle wave one, coming off the Supercycle low of March 2009 at SPX 667. 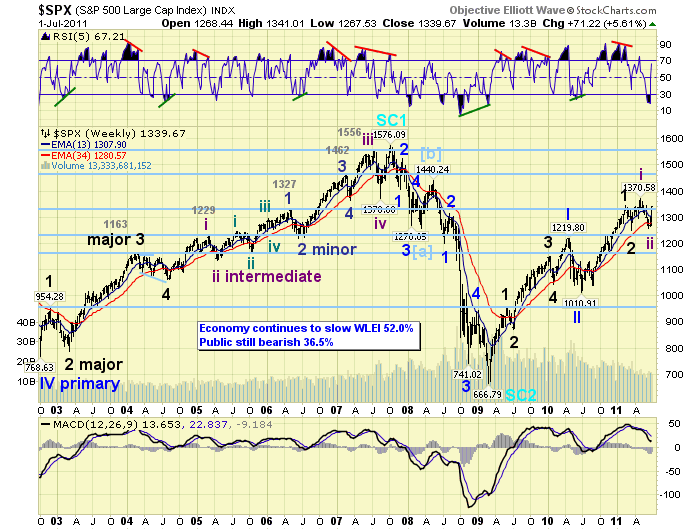 The first two Primary waves completed in April 2010 at SPX 1220 and July 2010 at SPX 1011 respectively. The current Primary wave three began at that time. Since Primary wave I divided into five Major waves, (as noted in black on the chart below), we expected Primary wave III to do the same. The first uptrend from the SPX 1011 Primary II low topped in February at SPX 1344. We labeled that Major wave 1. 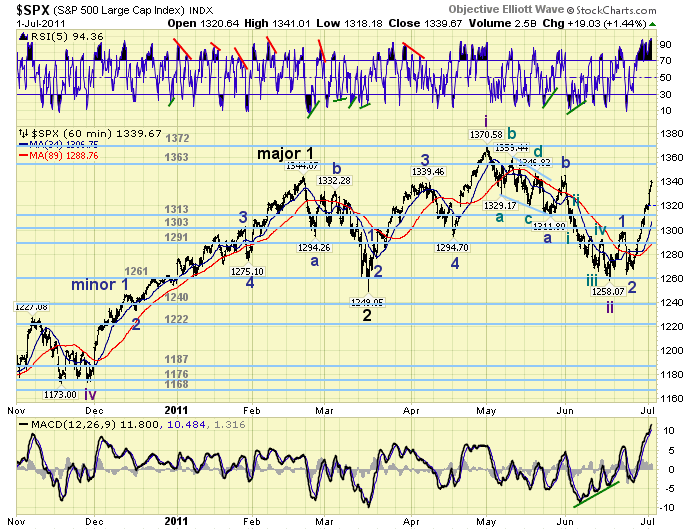 The correction to SPX 1249 in March we labeled Major wave 2. Major wave 3 should have started at that low. The following uptrend (Mar-May) and downtrend (May-June) was a bit tricky, in that the Techs (NDX/NAZ) completely retraced the entire uptrend, and the Industrials (SPX/DOW) did not. As a result we now have two slightly different counts between these two sectors. This is not unusual. Our primary count is posted on the SPX/DOW charts, since our bellwether index for the US is the DOW. This count suggests the March-May uptrend to SPX 1371 was Intermediate wave one of Major wave 3, and the recent May-June downtrend to SPX 1258 was Intermediate wave two. The current uptrend should then be Intermediate three, of Major 3, of Primary III. The mid-point, in wave structure, of the bull market. We noted last week the weekly RSI was the most oversold it had been since the bull market began, (see chart above). We also noted about two weeks ago the correction had changed character, in that it had not made a lower low (SPX 1258) after the gap up opening on June 17th. And then it had its biggest rally since the correction began: 41 points to SPX 1299. Most of that rally was retraced by June 23rd when the SPX hit 1263. But it held the SPX 1258 low, started to rally again, and took out the 1299 previous rally high on June 29th. Near week’s end a new uptrend was confirmed, along with a WROC buy signal – the first since early July 2010. These buy signals usually lead an uptrend confirmation, this one was coincident, and multiple signals suggest a very strong uptrend. On the technical front. Eight of the nine SPX sectors are in confirmed uptrends. They were all in downtrends recently. The NYAD, market breadth, has already made a new bull market high. Copper is uptrending, the VIX is downtrending, Bonds are downtrending, Crude appears to have bottomed, and the USD appears to have topped, (the EUR is already uptrending). Also, seven of the fourteen foreign indices we track are now in confirmed uptrends. They were all in downtrends recently as well. We are counting this uptrend as a five Minor wave Intermediate wave three. Minor waves 1 and 2 appear to have already completed at SPX 1299 and 1263 respectively. Minor wave 3 is underway now. Since Intermediate wave one ended at SPX 1371, Intermediate wave three has to rally much above that to prevent an Intermediate wave four, (the next downtrend), from overlapping Intermediate wave one. We would expect this uptrend to clear the OEW 1363, 1372 and 1386 pivots and then hit the SPX 1440 pivot before it ends. This would allow for a minor 4% – 5% correction, Intermediate wave four, to occur around September/October. Support for the SPX is at 1313 and then 1303, with resistance at 1363 and then 1372. Short term momentum remains extremely overbought. There is some short term resistance right at the current level: between SPX 1339 and 1345. These levels created resistance at the February uptrend high, the early April high, and the late May high. With short term momentum (RSI) at 94% and the hourly MACD well over 10, a pullback of 10 or more SPX points would help reset these indicators. Looking a little further out. Minor wave 1 rallied from SPX 1258 to 1299. 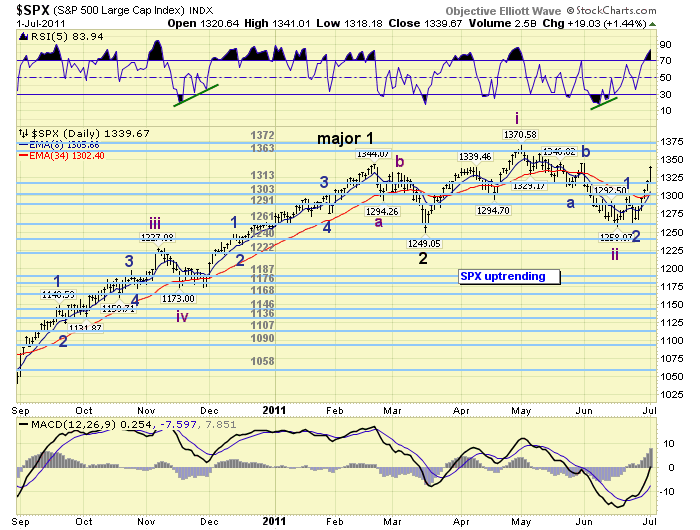 Minor wave 2 pulled back to SPX 1263. At the OEW 1371 pivot Minor wave 3 would be 2.618 times Minor wave 1. So we could get a small pullback from around current levels, and then a larger pullback around the bull market high for a Minor wave 4. After that Minor wave 5 should take the market to new bull market highs, and up to the OEW 1440 pivot. As a cautionary note. Should this market pullback to the 1313 pivot, the 1303 pivot, and then overlap SPX 1299, a correction process from the February SPX 1344 high may still be in progress. Best to your trading! The Asian markets were all higher on the week for a net gain of 1.6%. The Nikkei is in a confirmed uptrend and the other four appear to have bottomed. The European markets were all substantially higher for a gain of 5.2%. Four of the five indices we track are in confirmed uptrends. The Commodity equity group were all higher for a net gain of 3.8%. The RTSI is in a confirmed uptrend and the other two appear to have bottomed. The DJ World index is uptrending and gained 5.1% on the week. Bond prices confirmed a downtrend this week losing 2.3%. The 10YR yields are uptrending from the recent low of 2.85%: currently 3.2%. Crude (+3.6%) appears to have ended its downtrend within the support range posted on the daily chart. There is a large positive divergence at the recent low. No uptrend confirmation yet. Gold lost 1.2% this week as it continues its correction from the late April high. Support is around the $1450 area. The USD lost 2.1% on the week and the recent uptrend appears to have topped. The EUR (+2.4%) is already in a confirmed uptrend. Monday is a holiday in the US. Tuesday Factory orders will be reported at 10:00. On wednesday we have the ADP index and ISM services. Then on thursday weekly Jobless claims. On friday the monthly Payrolls report, Wholesale inventories and Consumer credit. The FED has nothing scheuled at this time. Best to your extended weekend and week! This entry was posted in weekend update and tagged business, economy, elliott wave, finance, investing, markets, OEW. Bookmark the permalink. Thanks for sharing your great analysis. I like to believe it, but rfijoydeep’s ABC-X-ABC is possible. Also, ABCDE triangle is possible, too. I think the key date may be 2011-August-2 on which the Congress decides whether the debt ceiling would raise or not. But they do not have any choice but raise it. Welcome SF07,Agree, they do not have any choice.Elections next year.They are using it as a political pawn. Tony, this is one of the best reports I’ve ever read. Congratulations !! And I think it is an excellent idea leaving a door open in case the correction is not over yet. Thank you so much for your great OEW analysis. Do you think it is possible that major wave 1 for SPX (also, DOW, NASDAQ, RUT, etc) actually topped out @ SPX 1370.58, and the decline from SPX 1370.58 to 1258.07 was major wave 2? I have the following reasons: 1) The waves structure and length of time for the spx correction from 1370.58 to 1258.07 (abc-x-abc or motive wave A – B – impulsive wave C with its fifth wave subdivided into a 5 waves trianlge with a truncated 5th wave spx bottom @ 1262.87) is one degree larger than the waves structure and length of time for spx correction from 1344.07 to 1249.05. 2) Based on technical analysis, the rally from spx 1249.05 to 1370.58 was a motive wave not a corrective wave (As you also agreed with your main count for SPX). Therefore, the SPX correction from 1370.58 to 1258.07 can not be a part of the SPX correction from 1344.07 to 1258.07 (Irregular complex double three or complex expanded flat). Please see a one year SPX daily chart. If the rally from SPX 1010.91 to 1370.58 is major wave 1 and the correction from SPX 1370.58 to 1258.07 is major wave 2, then, we have a classic EW waves structure relation, as follows: 1) Int. wave i @ 1129.24 equals to Int. wave v @ 1370.58 (plus or minus). 2) Int. wave ii @ 1039.70 equals to Int. wave iv @ 1249.05 (plus or minus). 3) Int. wave iii subdivided into 5 minor waves, equal or larger than int. waves i, ii, iv and v, as follows: SPX minor 1 @ 1150, SPX minor 3 @ 1227.08 and SPX minor wave 5 @ 1344.07. 4) Major wave 2, correction from 1370.58 to 1258.07 found support around bottom of int. wave iv (SPX 1249.05). Hi Masoodh, Sorry for the delay, it was a lengthy question.While the EW relationships did align in your analysis, which was quite good.The advance from SPX 1011 to 1371 was a quantified three waves.Since the advance from SPX 667 to 1220 was clearly five waves followed by a steep 17% correction.There are only two ways of counting the three wave advance from SPX 1011 to 1371.First, the NDX/NAZ count: a Major wave 1 followed by an irregular flat Major wave 2.Second, the SPX/DOW count: A Major wave 1 followed by a Major wave 2 and Intermediate waves 1 and 2.We prefer this latter count since the DOW was no where near fully retracing the Mar-May wave.However, your analysis suggests the SPX 1344 high was a premature medium term top … it’s not an OEW pivot.And the SPX 1371 high was where the market should have actually topped … it is an OEW pivot (1372).Now the market is bacck in line with the pivots.Interesting question, thanks. Do you happen to have any opinion on Silver Tony? Welcome Agarwal, Yes. Expecting it to correct further into the support zone on this chart:http://stockcharts.com/h-sc/ui?s=$SILVER&p=D&b=3&g=0&id=p72344026175&a=162802799.Then a gradual climb until it breaks out above $50. I suppose you mean decline close to 30.5 then? I have been a reader of your blog for over a year and think you do a superb job. Thanks for your dedication to this blog. I was wondering why you think silver will stop around $30 and not $26? Welcome Ggok, Actually we have a downside target for Silver in the $27-$31 range.The low end is actually that $26.40 print in January. You mention “WROC Buy Signal”. A google search leads me to http://www.ultrafs.com/i_ultra.htm and the Ultra 10 product. Is that what you use to see these signals? As always, I really appreciate your work and this blog. Welcome JK, No. The WROC is a proprietary OEW indicator.Nothing special actually, but part of the toolbox. thx. My count still favouring that we are still in 4th wave of C wave from march’09 666 level.This C wave started in july’10 at spx1010 level and 3rd wave of this C wave completed in may’11 at spx1371 level.This 4th wave will be ABC-X-ABC type of correction and we are in X wave which should top bellow 1350.After that we will be in another ABC down like the previous one which should bottom around 1240 in august-september.